There’s nothing quite like coming into a home after being out on a cold winter day and becoming enveloped in the rich aroma of a braised roast. This dish can be a one pot meal but I usually like to have it with mashed potatoes or a crispy baguette* and a palate cleansing salad on the side. Lamb Shanks can vary greatly in size, from a half to full pound each. In the US you have the choice of domestically raised sheep or imported from Australia and New Zealand. Those with a delicate palate can tell the difference but in general, domestic sheep tend to be a larger sheep and a little milder in flavor. Whereas Australian and New Zealand sheep tend to be smaller and more earthy flavored. The size and flavor is generally contributed to the sheep’s diet – American sheep are grain fed, thus making them larger in size and milder in flavor, where as Australian and New Zealand sheep are grass fed, making them smaller in size and giving the meat their distinctive earthy flavor. One is not better than the other, it is merely personal preference. I have used domestic and imported lamb and both provide pleasing results in this recipe. Comments on serving: After braising for 3 hours the meat will melt off of the bone but it will usually stay on the bone until gently pulled off with your fork. I generally estimate one shank per person, although if they are a full pound per shank it will probably be more than one average person can eat. The presentation of a whole lamb leg smothered in the braised beans and veggies, sprinkled with the colorful Gremolata is simply tantalizing. 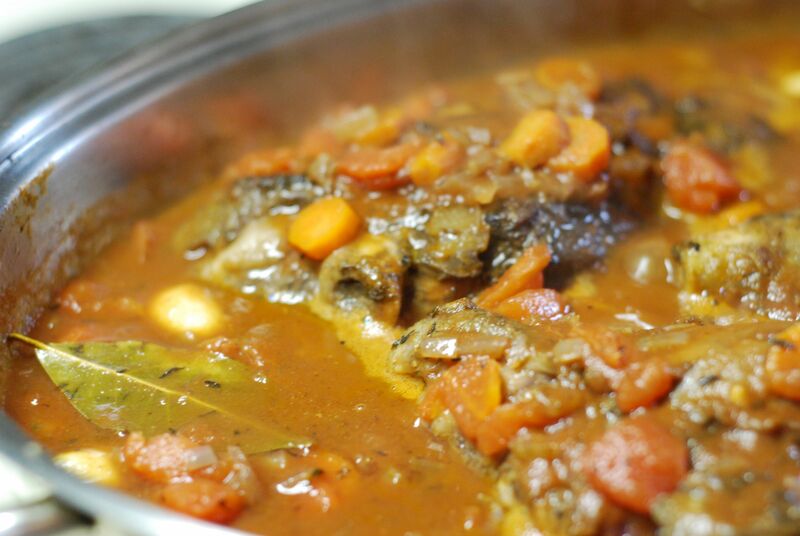 But sometimes it is more practical to pull the meat off the bone and serve it like a stew. Either way, its flavor will linger on your tongue and create fond memories. 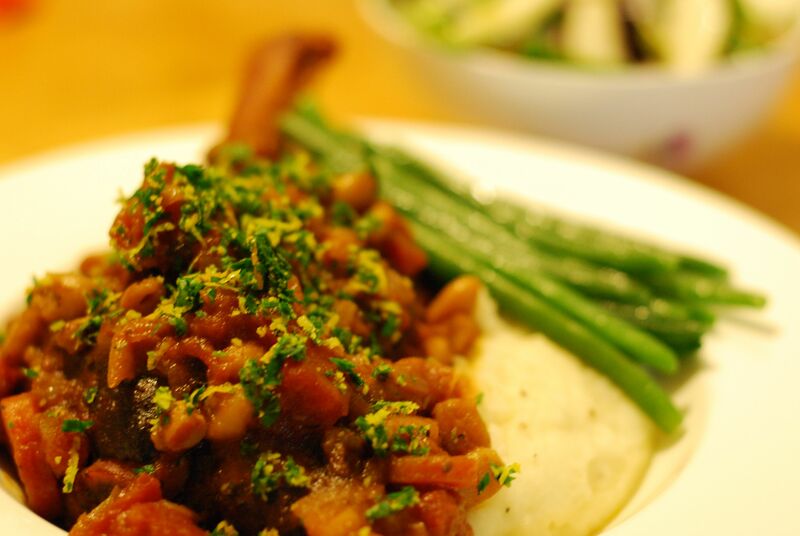 Lamb Shank, served on the bone, with mashed potatoes, and steamed French beans. On the side is a salad of baby romaine, topped with red onion and Comice pear and a light balsamic vinaigrette. Note: Dried herbs are listed in this recipe. If you choose to use fresh herbs adjust teaspoon measurements to tablespoons. Preheat oven to 325°. Rub Rosemary, Thyme, Salt, and Pepper onto Lamb Shanks. Heat 2 Tbls. Olive Oil in a Dutch Oven or heavy stove-to-oven-safe pan. Be careful not to over-heat as olive oil will burn at a lower temperature than regular vegetable oil. Sear the shanks until nicely browned. Transfer to a platter. If there is a lot of oil in the pan, remove some, leaving about 3-4 Tbls. Sauté Onion, Celery, Carrots, and Garlic until nicely glazed, about 3-5 minutes. Return Lamb Shanks to pan and add Red Wine and Chicken Broth. Bring to a full boil and add Tomato Paste, stirring it into the liquid until it dissolves. Add Tomatoes, Thyme, and Bay Leaf. Cover and place into a heated 325° oven and bake for 2 hours. Add Cannellini Beans and add more liquid if needed. Continue brazing for ½ to 1 more hour (total time 2 ½ to 3 hours). 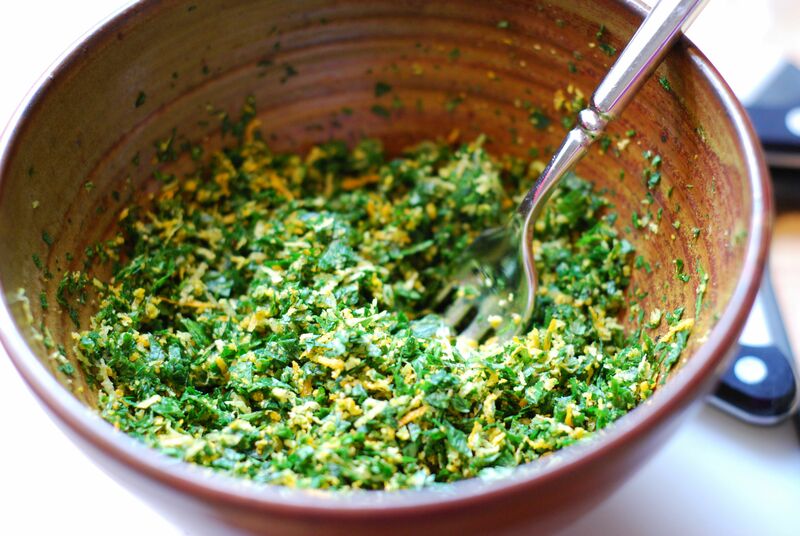 To make Gremolata: Combine Parsley, Lemon and Orange zest, Garlic, Salt, and Pepper in a bowl. Sprinkle Gremolata onto Lamb Shanks when served (amount is personal preference). Note about Gremolata: Leftover Gremolata is great rubbed onto chicken (whole roaster, split breasts, or leg pieces). Simply rub onto raw chicken, sprinkle with salt and pepper and bake. Another use is to saute shrimp in olive oil until just done. Toss cooked shrimp, cooked pasta (any shape, Orzo is great too), red onion, red bell pepper, and Gremolata in a bowl. I’ve made this recipe in a larger volume and seared the shanks in a pan but roasted in a large roasting pan covered with foil. 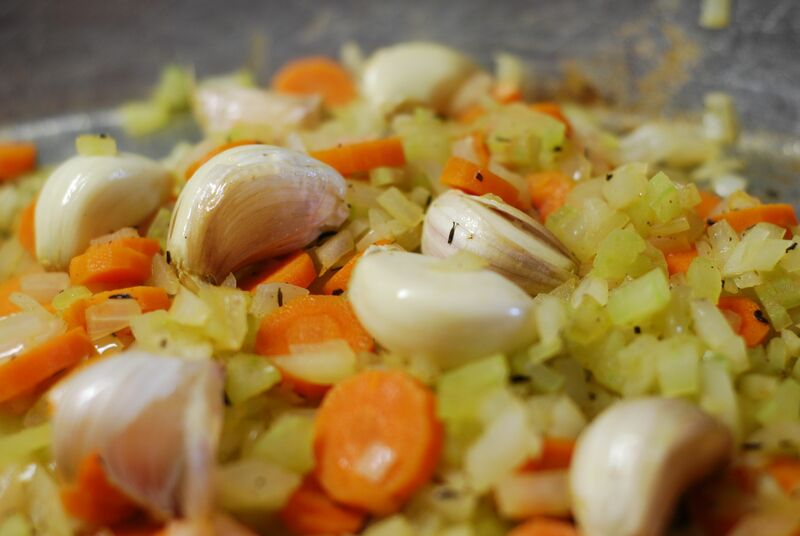 Just be aware that the liquid may evaporate quicker so you may need to add more broth or water during the braising time. I didn’t know the difference between domestic and imported lamb – thanks for sharing! When will you be serving this next? I’ll be over! Can’t wait for a chilly weekend to test out this recipe with some friends! Especially love your photographs – so enticing looking, and great way to see if I’m doing it right! You are currently reading Lamb Shanks with White Beans and Gremolata at Hestina's Kardia.